Situated at an altitude of 2.758 m., the Stelvio is Europe's highest road pass, connecting the Valtellina with the Val Venosta. It lies 22 km from Bormio and is closed in winter season. The Stelvio has been the scene of some major military and sporting events that have gone down in Italian history. Here the world's highest battle was fought during World War I. The dramatic images of the encounters between 1915 and 1918.ì, memorabilia form the so-called White War, and even a reconstruction of a trench can be seen at the Carlo Donegani Hisotry Museum, created by Banca Popolare di Sondrio and housed in the rooms adjoining the bank's local branch. 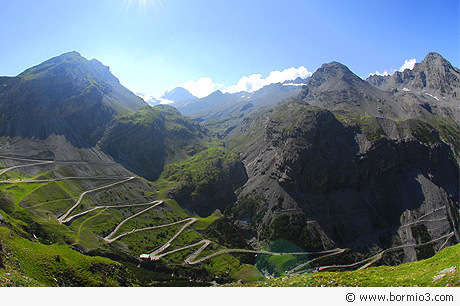 The museum also extensive technical documentation of the various stages in the construction of the Imperial Stelvio Road, the "Queen of the Alpine Roads": around twenty perfectly-planned kilometers engineered by Carlo Donegani in just five years between 1820 and 1825. Even today, the road still ranks as a masterpiece of civil engineering. Its creation was decided upon by Franz Josef I of Austria, for military purposes. Local sporting events owe much to the existence of this road. Racing drivers and, more significantly, cyclists have achieved some extraordinary feats here. The cycling heroes of the 1950s battled in out on the bends of the Stelvio Road, and it was here that Fausto Coppi earned his title as "Campionissimo". 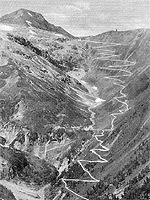 The Stelvio Pass was dubbed the "Coppi Peak" in several Giro d'Italia cycle races thereafter. The Stelvio Pass schools employ over 300 winter sports experts: some of Italy's best skiing instructors teach not only Alpine and cross-country skiing, but also carving , snowboard, freestyle and telemark.